The workmanship throughout the house is excellent, with a fine touch to detail that really shows Stroud Homes and the project manager really cared about the final finishes when they handed over the house to us.. All small defects or problems that were discovered during the final inspection were promptly rectified and the house was in excellent condition when we moved in. The project was well managed from start to finish, including guiding us through the approval process and we never really had any great stress from the time we went to the sales office at Jimboomba till the final delivery date. Customer service was always good and we were kept informed of all details and progress along the way and given prompt answers to all questions and any problems that arose. Best news ever, thank you so much, that’s so exciting. A massive thank you to the whole team there, you guys have been amazing to deal with. I was only telling some of the people at work this morning that the communication you guys provide is outstanding (just wish the bank had the same skills). The workmanship and build quality is excellent.Our dream home built in just built in 4 months by Stroud. From Jason the builder to Luke the Sales officer, Tony the designer, Kristry, Dulcie, Zoe from Office and the one and only Lindsey Jack the supervisor…Stroud have wonderfull team.We will reccomend all my friends to Stroud. Stroud knows what we want and they did it so perfectly. After living on a tiny block in a small house for years we decided it was time for an upgrade. We wanted more space and a much larger home built to suit our needs. We found the land – an acre block – easily, but we knew that to really make our dream come true we also needed to find the perfect builder. We went to numerous display estates and walked through some lovely display homes. We talked to a lot of sales consultants and got basic quotes from a few. We compared base prices, floor plans and inclusions and spent a lot of time talking to people who had recently built and reading build forums, slowly narrowing down our list. After viewing the acreage display home in Jimboomba Woods we knew we had found our builder and the house we wanted – Stroud Homes and the Kentucky 304 with mountain facade. Our first point of contact was with Bryan, the sales consultant. When we first enquired we weren’t ready to commit and put down a deposit (we needed to sell our current home before we would be able to) but Bryan didn’t place pressure us and instead spent weeks going back and forth with us via email until we had the perfect quote, that suited our budget, to move forward. Other staff members of the Stroud South Brisbane team – Trudi, Emma and Kenneth – helped us through the administrative side of things for the whole build including signing contracts, organising council approvals, submitting information to the covenant and clarifying any changes as the build went on. Communication was always professional and if we sent an email asking a question we always received a response in a timely manner – usually within 24 hours or less. This high standard of communication throughout the build really helped ensure that our build was smooth from the quote stage all the way through to handover. Early in the build process we were asked to come for our colour selection appointment to make decisions on everything colour and style wise from the shape of the cornices to the style of the bathroom cupboard handles. It could have been an extremely stressful and daunting process but wasn’t due to the support we received from Kylie the property stylist working with Stroud who helped guide us through our colour selections. From our discussions with other people who had recently built we knew that the success or failure of a build was largely dependent on the site supervisor. We are extremely thankful for our site supervisor – Peter – who’s organisation, scheduling of tradies and communication with us made the whole process stress free. We received a phone call a minimum of once per week from Peter who would then let us know what progress had been made that week and what would be happening the following week. We were able to schedule multiple appointments throughout the build to walk through the home with Peter and ask any questions that we had at each stage and ensure that all of our variations and upgrades had been included. When it came time for PCI we were extremely pleased as only a few minor things needed to be addressed – mostly minor painting touch ups- which were quickly rectified. We were able to get the keys to our new home on schedule, a few weeks before our current rental lease was up. We have now been in our amazing new home for a few months and couldn’t be happier. We have not had any problems since moving in and are extremely pleased with the quality of work and the finishes in our home. Should we ever decide to build again, we know of at least one team that can get the job done, within budget and on time! Thank you again Stroud Brisbane South Team! The workmanship and build quality is absolutely perfect and as far as the build goes. Could have not have had a better supervisor. When it comes to customer’s service and support again that was unquestionably well done. What I suggest Stroud’s to family and friends? Now the probably likelihood of again we will most certainly be dealing with Stroud builders. Right from the outset we have absolutely no complaints whatsoever that we would highly recommend to anybody if they are looking to build a new home Stroud’s for two reasons one the plans and two the quality of service. Right from the moment we walked into the Gold Coast display home, we fell in love with it and decided pretty quickly that we wanted a Stroud Home. I loved the fact that everything was included in the quote upfront and there were no nasty surprises. I have heard horror stories of people going $100,000+ over with other builders and we were pleased with Stroud’s black and white quotes. The salesperson (Martin) was extremely helpful. I’ll be honest and say that the contract administration stage was stressful. Things like requesting prices for upgrades etc would often take days to get a response as it was handled by a different department. I understand this is your process, but as the customer we found it frustrating and really just wish we could be handed a price list. Our original contract administrator was often very short with us and at times we felt like we were annoying her. The build – Straight away we felt at ease when we met our Site Supervisor, Dave. He was honest and upfront and didn’t make any promises he couldn’t keep. We loved the Voxer app and were kept informed the entire way. We had a few hiccups, which are to be expected when building, but everything was handled efficiently and to our satisfaction. The tradesmen used by Stroud were fantastic. The electrician, the plumbers, the tilers and in particular the wonderful painters. They were always friendly and professional. Our build did go slightly over time, but as per the contract we were compensated, and at the end of the day, a few extra days are insignificant, as we now have a beautiful home that we are proud to show off to our friends and family. We are currently building with Stroud Homes and our experience so far has been a very happy one. From the beginning dealing with Jared and Travis which they have been so helpful and very easy to communicate with. Now that the construction has commenced we get weekly updates and photos on the Voxer app which I think is amazing as we have never had this before when built previously with other companies and Dean our Site Manager has been great to deal with also nothing is a problem and always polite, therefore so far our experience with Stroud Homes has exceeded our expectations and would highly recommend them. This was my second time building a new home and I have to say that working with Stroud Homes Brisbane North has been an excellent experience. My site manager Ben Rogers was fantastic to work with. I would get weekly phone calls and Ben would advise me of where they were at and what was going to be next in the building of my new home. Practical completion was also 3 weeks ahead if actually date. Once again thanks to Jace, Kyle and Ben. From the moment we decided to build our first family home with Stroud Homes Gold Coast the process was easy, stress free and very rewarding. From Nathan and Terri to the wonderful staff in the office to our supervisor Phil and everyone else involved, everything went smoothly and to plan without any of the stress and headaches people talk about when building a home. Our final product is everything we could have hoped for and more with all of the extensive inclusions the house well and truly exceeds our expectations. The quality and workmanship is evident in every room and we have been left with a family home that we are exceptionally proud of thanks to the Stroud Homes Gold Coast team that we look forward to spending many years in. By far the best Builders in QLD and Australia!!! Stroud Homes (Brisbane West) were absolutely fantastic in every aspect of our build. My wife and I built our first house in Adelaide through a different builder and had a less than desirable experience. Once we met Megan, Jason, Kristy and Shane, we knew that we wanted to build again. Megan was extremely professional and friendly in her approach and was able to accompany our every need. Working through to contract, we dealt with Kristy who was very friendly and knowledgeable. She answered all our questions and made us feel very comfortable. During the building phase, we dealt with Shane who was very helpful. He was very open and honest, and always kept us up to date with everything. Jason is an outstanding businessman and manager and is very professional in his approach. The workmanship and build quality of the home is 2nd to none and they would always go above and beyond for us. We both highly recommend the Stroud Crowd at Brisbane West for your next build and look forward to catching up with everyone in the new year!!!! Couldn’t have had a better Build! The entire team at Stroud Gold Coast were great to deal with from start to finish! Professional, helpful, approachable & understanding throughout the entire building process, we were so happy with our decision to build with them & our finished product is incredible! They worked with us to make all the changes we wanted and the entire process was really stress free! We are Very Happy Home Owners! We would recommend Stroud Gold Coast to anyone thinking about building! As first home owners/builders we had no idea what to expect in terms of price, quality, timing, etc. The whole process was amazing for us. First we had Megan as our sales assistant who worked with us in creating our dream home and she had all the facts and knowledge at her disposal. My father, who has been an electrician for over 30 years, was throwing questions at her that he already knew the answer to just to see if she knew or if she would find out the correct facts and he was very impressed with how she never played any games, answered honestly and knew mostly everything off hand. After this very easy process with Megan we moved onto Kristy who helped us with the bank. Our bank was a bit of a pain in the head but Kristy worked with us and the bank to get our unconditional approval as quickly and easily as possible and I can’t thank her enough. After Kristy we moved on to our building supervisor Shane. He was also a pleasure to deal with and put up with all my stresses and tantrums (lol). With every build, things can go wrong it’s a fact. We had a few issues that arose along the way that were both avoidable and unavoidable however, Shane and Jason (franchise owner) were always eager to put their hands up and fix any issues that we had. Eg, we weren’t happy with the fencing so this was fixed at no extra cost. Shane was always contactable and answered any questions I had in minutes. Knowledge is power and every person I spoke to at Stroud were very confident in their brand, their product and most of all knew what they were talking about. As you do with all new homes we have had a few teething problems since moving in and Shane has had every single issue addressed on the same day I contact him and it’s fixed within a few days. After speaking with many other friends and family members who are also building I am so happy we chose Stroud as some who started before us, still haven’t moved in! I am a very strong Stroud supporter and will recommend the Brisbane West branch to anyone who is looking at building their dream home as it really was so much easier than I ever thought it would be and by the looks of other peoples experiences, Stroud was the reason for that! We first started looking at display homes just over a year ago after purchasing a large corner block in Augustine Heights. We stumbled upon the Wildflower display home in Deebing Heights, and immediately knew we wanted it. After a long chat with Jason, the house looked even better. After months of back and forth with updates to quotes, floorplan changes and house positions we had a contract. Never once during that time was there an issue or delay in response to endless questions and changes. Jason, Kristy and Dulcie were never difficult to get a hold of during the initial stages. And once the build started, Shane’s weekly calls keep us informed of the progress, while Jason made himself easily available. During the final stages of the build we came across our first major issue with a sub contractor installing a skylight in the wrong room. This was handled great with Shane and Jason ensuring the mistake was fixed to our expectations, and we were kept in the loop of the required repairs and progress. After a week living in our new home, we couldn’t be happier. Thanks Stroud West Brisbane for an easy, stress-free first time build. Definitely recommend Stroud to anyone, and would build again with you. Our home building experience with Stroud Homes Brisbane West was exceptional. The build quality was top notch, with Shane the site supervisor forcing his team to get it to a standard that even I wouldn’t have expected. Jason was also extremely helpful, and was happy to answer my questions no matter how trivial they were. The weekly update call from Shane was also a great feature of building with Stroud, as it gave us information on how they were going and also gave us the opportunity to ask any questions that had come up during the week. All of the staff were extremely helpful whenever we had any questions, and in particular Kristy was always friendly and made sure that my questions were answered. Overall, we would definitely recommend Stroud Homes Brisbane West to our friends and family, and would happily build with them again in the future. Great build and it was. As a builder I know how stressful building is and Jason and the Team at Stroud Homes Brisbane West were fantastic, from the start to finish and ever after we moved in. We change a few item in the design which was not a problem very thing was explained clearly and there were no hidden extras , like you hear about form friends and family about other builders. The Construction process and fitout was hassel-free and the weekly report from Shane, kept us informed during the entire build. My wife and I are extremely happy with the build and so is the family , I have been ask a number of times when mowing the lawn who built your great looking home, and I tell them Stroud Homes and the team from Brisbane west and I Highly recommend them. We chose Stroud Homes to build our latest (and last home) and were very glad we did. We’ve now been in our new home for 4 months and are totally loving it. Dave Slaughter was our Site Manager for the build and he was fabulous to work with. He really looked after us and made us feel very comfortable asking any questions. He’s such an asset to Stroud Homes! Our house was finished in about 13 weeks which was great for us as we were paying rent and mortgage and it made such a difference to know everything was being done to get us in as quickly as possible. The workmanship and build quality was great. Everything we expected of our home was delivered. We were really happy with all the finishings and pleased with the quality. 4 months down the track, everything is brilliant. Customer service and support was great, always of a high standard. We’ve had neighbours asking about our house and how our build went and I’m proud to be able to say that we definitely chose the best! Confirmation of that has been in hearing how many problems our neighbours have had and hearing how many of them are unhappy with other companies. We only had one issue, which was with the tile supplier selling out of the tiles we chose. I was contacted and kept updated and asked to pop in to choose tiles from the National Tiles range. The issue was handled really well and we were super happy with the outcome. I would definitely recommend building with Stroud Homes. My partner and I decided we wanted to build our first home together and we couldn’t have been happier with our choice to use Stroud Homes on the Gold Coast. From the initial planning through to the actual build, the wonderful staff at Stroud were attentive and helpful and made the process very smooth. As we had never built before, the information and support from the Stroud team was amazing. Our site supervisor, David, was fantastic throughout the whole build with regular communication and photos of how the build was progressing. There were only a few minor things we had to change due to unavailability of stock (like floor tiles), however David was able to find near identical replacement stock quickly to avoid delay. David was very reassuring during the whole build, easing any of our concerns. We have been in the house now for nearly two months, and have had both our site supervisor and the administrative team at Stroud contact us to ensure we are happy with the result. The finishings, fixtures and appliances are all of great quality and no problems have arisen at this stage. We have had a very positive experience building with Stroud, especially considering how stressful buying and building your first home is. I would have no hesitation in choosing Stroud if we ever decide to build again! I just built a home in Beaudesert with Stroud Homes. The team were fantastic – great support, constant communication, nothing was a problem. The contractors were also great to deal with and even hired them for other work. I have built before and for a change this time the yard was left spotless, not like other builders. The finished product is beautiful, on handover only minor things to be dealt with and they were attended to within the week. I think our biggest drama on building was the council. If I decide to build another property I would turn to Stroud Homes again. We discovered Stroud Homes from advertising on facebook, the Canadian / North American themed Facades is what got our attention. As this was the first time we were building a house we found that with Stroud Homes (Brisbane West) it was easy and not so daunting. From the very beginning when we met Megan in the display home to discuss options for what we like to build she was very helpful and understanding. We didn’t even own a block of land at the time, but Megan was eager to assist us in anyway possible to help us find land and secure it for us. On several occasions, we felt she went above and beyond in assisting us. We originally spent a bit of time wanting to continually make changes to the original plans to try and fit our budget. Never once did anyone ever complain that we were making to many changes or using up their time. Eventually we did settle on building the display home just as it was (Wildflower 256). Once we had plans for the Wildflower 256 we met Jason and never once just Jason complain about all the little things we wanted done to the plans of the house to make it just the way we wanted. Once construction started we met Shane on site, and further discussed how we wanted the site to be finished off. Shane was very understanding in that we would want the site finished off in just the right way. Shane was great in keeping us updated each week and anytime we ask for something more to be done he was sure to get it done promptly. On several occasions we would definitely say that Jason bent over backwards to meet our needs and expectations. From little things that we changed once the construction had started, like adding additional lighting to the additional landscaping we requested in the last month of construction. We always felt like Jason and Shane were listening to us when we wanted something. As Jason would say, “it’s your home, it should be just how you want it to be”. We would definitely build with Stroud Homes (Brisbane West) again. We would like to thank everyone at Stroud Homes for making our build, easy and stress free. And for giving us our amazing home. Fantastic first experience with Stroud Homes! Stroud Homes built my very first home and what a remarkable experience it was! I have been living in my home now for over seven months and my partner are over the moon. Hearing friends and family tell us all of the bad experiences that they have had with other builders made the process very daunting for us as first home buyers that we even considered buying an existing home but the idea of a perfect new home with everything we need included was just to good to resist. Despite all the stories about other builders we got nothing but the best building with Stroud Homes. It was a truly enjoyable and hassle-free experience! Stroud Homes Brisbane South did a wonderful and professional job. We were kept informed every step of the way and any questions that we had about the build were always answered without fail. Coming home to a Stroud Homes is something we are very proud of! We are always recommending Stroud Homes to our family and friends and will definitely build our next house with them too. Building with Stroud Homes was a fantastic experience. My partner and I really enjoyed every step involved with building our brand new Stroud Home. From the first stages of planning the house to the handover we both could not fault the team. Our site supervisor kept us informed through the whole build with every Friday calling us and informing us about what had been done this week and what was happening next week. He was a delight to work with, with no issue being to big to handle. The quality of the build was second to none. The finish of our home was fantastic, moving into our new perfect Stroud Home has been a great experience and I recommend that everyone build with Stroud Homes. I will definitely be building with them again for my second home. Workmanship was of high standard with quality finishings. Build went very smoothly with no delays or issues along the way. Customer service was fantastic. GC stroud was helpfull and very accomodating. We received some extra touches which we thought were upgrades but are actually standard inclusions. I found Stroud to have one of the best range of standard inclusions. As first homes buyers this was a big step for us and im glad we chose to build with Stroud Gold Coast. I would definitely recommend Stroud. We are very happy with our experience and most of all our home. It was really wonderful, I have been looking for building company for a while and I found Stroud homes which was advertise as 16 weeks build time. The process with the design and work was really amazing and even gave some advice on the go. It was really awesome to know when I used to get the picture of my home, how fast it was building. The job was done really quick in the couple of stages but slows down at the end of the building because of the materials couldn’t arrived on time. It was really frustrating at the final stage but overall it was great journey with Stroud homes team. Customer service was great and anytime ready to meet with the clients. Moved in a month before and forwarding my issues in the house and has been fixing all of my issues one-by-one, still some more to go. Hopefully everything will be finished by next month. I have a good experience with Stroud Home. Customer service is good. We are well looked after so far. No hesitation in recommending them. The house was built with great workmanship. There were some obstacles along the way, but our Site Supervisor was great at bringing these to our attention and finding an acceptable resolution. The whole build experience, from breaking ground to completion was excellent, thanks to our Supervisor. We had some administrative struggles during the plan finalisation phase, where the lack of attention to detail caused some delays and frustrations. Nonetheless, the end result was great and we are very happy with our first home! My husband and I had a great experience with Stroud homes. This was our first house and had no idea what to do or what to expect, but Stroud Homes were so helpful and answered any silly questions we had. Matt was great to deal with he does such a great job, he made sure everything is done perfectly. We also had the best supervisor (Das) he went above and beyond to make our house perfect, he answered any questions we had and was happy to meet with us whenever we needed to. At the end of the build we had a few little things that needed to be fixed (nothing major just grout) and the Stroud team fixed them straight away. We are so happy with the finished product and we love our new home. Thank you Stroud Team for doing such an amazing job and making this experience so easy and wonderful. We love Stroud Homes! The workmanship and quality of the end result was fantastic. The team did a great job in focusing on attention to detail. Our site Supervisor Peter Simpson was amazing!! He was on the ball all the time and was a pleasure to deal with. The office team were amazing as well and were very supportive and professional. Stroud Homes (Brisbane West) were fantastic! Jason & Shane were great, they were quick to fix any issues we had (although there were very few). This was our first home/build so it was quite daunting for us but Jason made the process very easy. We really liked that we received an update from Shane every Friday afternoon throughout the build. Overall we are extremely happy with the end result & we have a beautiful house to call home. We were looking for a new home with a granny flat and having issues with finding a builder who wouldn’t change the earth for it. A local real estate agent recommended Stroud Homes for building houses with granny flats so we went and had a look at their display home, a Wildflower, and loved the open design so much we went for a house in this series and added the granny flat on the side. During the negotiation period it was no trouble to alter anything in the house to suit what we wanted. Bryan the sales agent was excellent and nothing was too much for him. From the start to the end of the build they were upfront and professional and went beyond our expectations and kept us well informed all along the way and answered our questions promptly every time. We moved into the house earlier than the contract date and we found the finish of the house was excellent. Nine months on and we still love our house like the day we walked into it. Overall our build with Stroud Homes was excellent and we would definitely recommend them. From the moment we walked in the door we got great personalised service, from Sales and Administration to our experienced Site Supervisor. We especially loved our colour consultation and it was great to have someone experienced to help us make the important decisions to get our home looking as good as it could. Having never built before we had heard lots of horror stories so were a little unsure of how everything would pan out and I am happy to say that everything ran like clockwork. We couldn’t believe how quickly our house went up and we are totally happy with the high quality finish. 1 Year On & Still Going Strong!!! We built with Stroud Homes Brisbane West & moved in Dec 2015. I’m writing this review over a year on and we are still as happy in the house today as we were on the day it was handed over! The build quality of this house is excellent and I can’t express how well the end to end process was. From the day we first met with Jason to go over ideas to the day of handover, we were always treated as a respected client and told the truth. Shane, the site supervisor, was always in touch either in person or on the phone and made the construction process a breeze. A year on and the house has no defects of any significance. In previous houses we’ve built, we’d be finding loose tiles, massive cracks in the walls or something else of concern. Nothing like that in this house! It’s so very pleasing to know we made the right choice with the Stroud Brisbane West team. A build that really does – Feel Like Home! 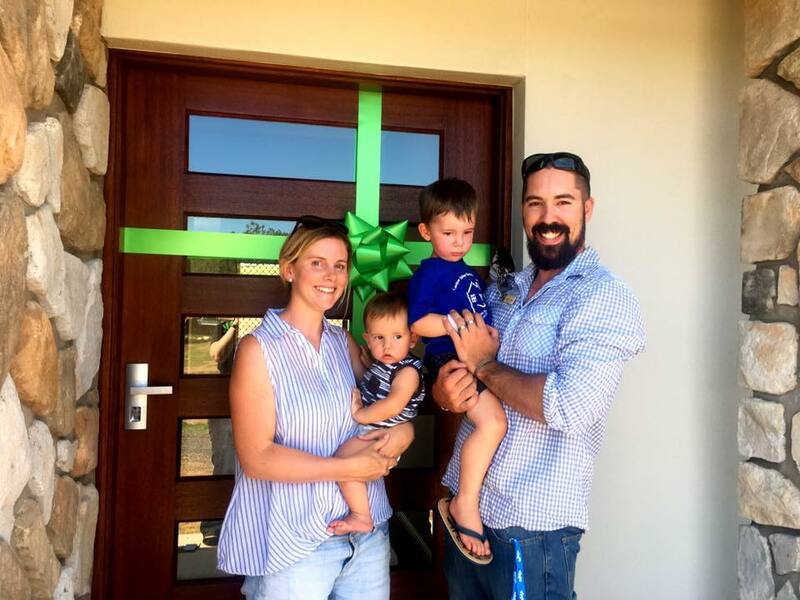 From the moment my family walked into the Stroud Homes Jimboomba office we knew we had found the builder for us. The warm and friendly reception we received from the sales staff was refreshing, it didn’t feel like they were only there for money or trying to up-sell but were informative and helpful. Having such a huge part in the design stage was incredible, being able to meet and sit-down face to face with the person making the changes we wanted was so much easier than trying to explain the things we had in mind over an email. The choices available as standard was and still is, unbelievable. We went into our colour selection a little bit doubtful as to how much extra this would end up costing. But came away with the perfect choices for us and it was all already included, so we didn’t have to pay any extra at all! Stroud really are Black and White right from the start! While waiting for the plans to come out of council and continuing right throughout the entire build we were given weekly updates via phone calls, messages and emails on the progress of each stage, what had happened that week and what was happening next week. We didn’t live close to the area we were building in so this made it easy for us to decide when we would make the drive out to see how our dream was taking shape. And if anything big was happening we always knew well in advance when it was scheduled so we could make time to meet our supervisor on site and not miss out. The consistency in the quality of workmanship we see in our Beautiful New Stroud Home is a testament to the Stroud team’s ethics, and we wish to thank everyone involved from that first day right through to receiving the keys to this amazing Dream Home for making the process feel like a dream but becoming our reality. Do yourselves a favour and build with Stroud Homes. Building a house was a daunting thought for our family. After spending countless weekends doing the rounds with the run of the mill builders it was apparent that our block of land would require a custom build if we were to receive what we wanted. After becoming frustrated with other builders designs and ideas we set out to visit the new arrival in town being Stroud Homes. I recall meeting Yarren and discussing our ideal house, It was refreshing to find someone who could understand what we requested. Yarren’s expertise and practicality was a welcome necessity. Throughout the whole process we were kept informed of the progress and what developments would happen next. We have been thoroughly impressed with the start to finish of our brand new home the workmanship is 2nd to none. Upon completion a few very minor details required attention and Yarren had this seen to immediately. All things considered I would have no problems recommending Stroud Homes (Yarren in Coffs Harbour) to family & friends or anyone who is considering building. Firstly, I apologise for the length of this review, however I have tried to be as comprehensive as possible so as to give the review they deserve and that others can use. My wife and I were first home owners and we started building in North Brisbane with the North Stroud Homes Office in late 2016 following a land purchase in March of the same year. Due to the unique design of our block (side and backward sloping corner block) and the accompanying easements and setback requirements, we quickly realised that we would need to create a custom designed house specifically for the block. As we didn’t have the money to pursue a private builder, we narrowed down our decision to either Stroud Homes or the other big name (Valeco). We received quotes from both companies, and despite being very similar in price we decided to go with Stroud Homes for several reasons, with the primary reason being their customer service, level of inclusions and build guarantees. SALES/DESIGN PROCESS: We dealt with Kyle for the majority of the entire process, with him being the brother of the business owner. I honestly have no words to describe how excellent this experience was as he was always polite and happy to help regardless of how many or how stupid my questions were. I honestly was texting or calling the poor bloke at 9pm sometimes and he was always happy to answer and give me an honest response. For the design itself, I took one of their standard 2 storey designs, and completely stripped out the downstairs and redesigned it to fit what I needed and kept the upstairs mostly the same. Throughout this entire process, Kyle would happily work with me while I made constant changes to the plans. Having the freedom to create a custom design without worrying about being charged a fortune for any changes like most companies was extremely refreshing and liberating. We were able to create a unique design that perfectly fit our lifestyle and land without paying anything extra. We consistently get compliments from people saying they think our house is the nicest looking in the street, but we wouldn’t have been able to achieve this without Kyle working as tirelessly as he did to ensure that everything was perfect. The only thing that let the process down was the time it took their draftsman to apply the changes I made and send the plans back however I am not the most patient individual and probably don’t understand the level of work required. One of the things that we mostly appreciated was that their show homes weren’t designed to draw you in with flashy finishings and then you later find out that it costs twice as much to have them as the price you were quoted. With Stroud Homes, literally what we saw in the show homes was what we got in our standard finishes. Further to this, we decided to install downlights throughout the house, however I really wanted to source my own lights instead of going with the builder selection. Stroud refunded me the cost to install all of their lights and then allowed me to purchase all internal lights privately and simply charged me a small fee to install them for me which was more then reasonable. The same went for some special tiles we wanted laid, they were happy to credit us their tiles and simply charge a small fee to lay them. It was small touches like this that really helped them stand out and made the process as enjoyable as possible. We had heard that with a lot of builders, you get the basic electrical plan and then they charge a fortune to add anything on, however we were happy to find that Stroud offered a comprehensive electrical quota and were very reasonable with pricing for additional extras. We really did find that having the inclusions as the same level as the display homes helped us to actually visualise what it would look like when we did made upgrades on some items. Because the standard was already so high, there were very few things that we wanted to upgrade and when we did, it really showed and we can appreciate them instead of the entire house needing an upgrade due to a poor baseline level of inclusions. Because of their transparency with their pricing and inclusions, it did make it a little hard for us to justify putting in a ducted air conditioning system simply because their price seemed so much more expensive then other builders who always offer those cheap deals for upgrades, however those deals aren’t actually a fair representation of the cost of the air-conditioning because they have already factored the cost into your quote regardless of whether you actually choose to go with it or not. With Stroud, because they make it simple and don’t try to lure people in with fake deals and instead allow their product to speak for itself, the big ticket item of air-conditioning felt expensive however in reality was a very fair price and we are so thankful we got it as I cannot live without it. BUILDING PROCESS: The building process went well for the most part, although it was complicated at times by the weather and site works. We had some minor communication issues with the site supervisor throughout the build due to some personality conflicts, however he no longer works for Stroud and the new site supervisor is a delight to communicate with. I was able to stop past the site regularly and have periodic walk throughs where all my questions were answered and any issues rectified. We have heard all the horror stories about builders before, one of those stories even happened to someone else building on our street, so I had never imagined I would consider a builder to be honest and trustworthy, but that is exactly what the owner Jace is. During our quoting process, they came out to look at the site and advised us we would need a small retaining wall so we had it included in the quote. Once the build started and they began the earthworks, they found that the site was sloping considerably more then they had estimated and realised that we would actually need a much larger (and therefore considerably more expensive) retaining wall. What shocked us was that Jace approached us and said that he believed it was something that could have been foreseen and therefore he considered it their problem, so he footed the bill for the retaining wall and the backfill we needed, which would have cost us approximately an additional 20K. To this day I still can’t believe that he did that and acted with such integrity and readily took ownership of the issue. I’ve never in my life heard of a builder doing that, and even if it were for nothing else, that act alone would ensure we recommended them and used them again for any builds we do in the future. FINISH QUALITY: In terms of quality, we were extremely happy with nearly every aspect of our home. My dad being an ex-builder had a look through and said it was done to an extremely high standard and couldn’t fault anything. There were minor issues we picked up over the next 12 months however there were no major problems and we were able to submit a very small defect list at the 12 month mark a few weeks ago. The new site supervisor was very quick to jump on top of the list and everything is currently being fixed. The only defects we had were some small cracks in cornices from the house settling on the building pad due to the substantial fill we needed and some minor paint touchups. We did have an issue with the borders around the windows at one point as it was something I had been discussing with the previous site supervisor and it had never been rectified. However, about 6 months later when I contacted Stroud North, the owner personally came out to have a look and agreed that he wasn’t satisfied with it either and then arranged for it to be repaired at no cost. He apologised and said that he had actually instructed the previous site supervisor to address the issue months ago, however due to some communication problems, it had never been taken care of. Thankfully, they did a tremendous job and I am now very satisfied. Again I apologise if it’s a little long, but I really do feel like these guys deserve a detailed review, simply because they gave us an amazing experience building our first house, and I still hear horrible stories from so many people and I’m just so thankful that we aren’t one of them. Jace has said to me on multiple occasions that he wants to be in the building industry for the rest of his life and he takes pride in his reputation as a builder. He is certainly right to do so, and if the rest of the industry was like him then it would be a marvel. I have no doubt that Stroud North will continue to prosper simply because of the way they approach business on a personal level. They actually care about you as customers and they consistently deliver a quality product. We recommended Stroud to other people on our street and now have two other houses built by them next to us, and their level of standard hasn’t dropped at all. In summary, I recommend these guys as THE people to build with if you want a stress free build and a beautiful house. I constantly recommend them to friends and people who are considering building and if you choose to go with them you will not be disappointed!! Would give 6 stars if possible. We have been living in our new Stroud home for a little over a month now and are so far very happy with the level of workmanship and quality of the appliances and fittings. For us the build process proceeded without any major problems (just a couple of bad weather delays) and we found the staff at Stroud Northern Rivers and the tradies friendly and easy to deal with. We were impressed with the processes Stroud Homes have in place regarding keeping its customers regularly updated and informed via the us of the Voxer App, weekly progress emails or phone calls and customer access to the idetect camera that Stroud Homes have erected on site and we would encourage the staff at Stroud to keep using them. Did everything go perfectly without a hitch during our build? Well no, there were a few little things that came up along the way but we found the staff at Stroud were able to explain or address the issues to our satisfaction. All things considered my wife and I were very happy with our experience in choosing to build with Stroud Homes Northern Rivers. From the moment we stepped into the display centre at Warilla, we felt confident that we were dealing with a quality builder. Travis, being the owner of Stroud Homes, but also a builder, was easily able to answer all our questions, no middle man. We are extremely happy with the whole process, from start to finish. We were kept informed the whole way through with weekly updates, which were great, Dean the supervisor is one handyman! Highly recommend Stroud Homes for their excellent communication, quality work, and timeliness. With such a huge investment in our future, we would like to thank the team at Stroud Homes for the great job on our home, for their patience and their experience. Love our new home. Stroud were up front with the cost with no nasty surprises during the build. All the girls in the office were friendly and easy to deal with. Any issues were resolved quickly and reasonably. The main thing that stood out for us was the communication, we built a home previously with another builder who were very poor with communication. Highly recommend building with Stroud. Seamless build time, quality finishes, beautiful homes! We didn’t want to build our home with a franchise, knowing that part of our money would be going to an executive in a city somewhere, possibly overseas. By choosing to build our home with a local family owned company like Stroud Homes, we have been able to ensure that the money we are spending is being kept within our local community. This means that our home hasn’t been marked up with ‘secret taxes’ to cover the loyalty fees that many customers of franchise homes often complain about. Another thing that we have appreciated about [name removed] and [name removed] service is that they listened to what we wanted and allowed us to make many modifications and add-ons to their plan in order to meet both the needs of our family and ensure that the home is efficient and as environmentally friendly as possible. As we have not built a home before, we really appreciated the more personal touch that is offered with this company, such as providing us with weekly updates via phone and “FAQ’s” to answer many of our questions, which has been reassuring. Also of great importance to us was having a guaranteed time frame for the build for peace of mind. Communication has been consistent and reliable throughout the process which has been very beneficial to ensure that everything is working seamlessly. Although the construction of our home is not yet complete, I have found this team to be dedicated to delivering the promises they make, often going that extra mile to achieve customer satisfaction, quality finishings and beautiful homes. When we decided to build a new house our friends thought we were mad, as we are both in our late 60’s and it can be a awful experience. Well I have to say that Stroud homes were so easy and efficient that there was no stress at all. They finished well within the time allotted and have built a great standard of home. From when we chose the home and right to the end all the staff have been friendly. If we had any questions as you do, they were dealt with straight away. [name removed] the supervisor rang every Friday to let us know what was going to happen the following and it happened. They made what can be a very stressful time, a pleasure to watch our house grow. If I was to build again I would definitely use Stroud. Thankyou for our beautiful well built home. As soon as we walked in to the Stroud display home and met Luke we were sure we wanted to build with Stroud. We were worried about the stress of building a house but all the staff made sure we were happy and answered all our questions. We couldn’t believe all of Stroud’s inclusions. We absolutely love our house and if we ever build again it will definitely be with Stroud. We have been dealing with Jared the past couple of weeks in quoting and now accepting a brilliant design for our new home. We have been extremely happy with the level of professionalism and communication from Jared. Nothing has been too difficult for him and he has always responded to us in a timely manner. We can’t wait to build with them and look forward to our new home! We would like to thank you for helping us in our building journey. When we first met with you and you showed me the federation façade I knew that we were onto a winner. Thank you for all the time you took with us to set up for our build. It can’t have been easy setting up a business plus having all our questions to answer. We really appreciate the advice and attention you gave our house. Additional input on things we would not have known or thought of as we have never built before. We love our house from what we have seen so far and cannot wait to make it our home. We have received so many compliments by those who have seen our place and that is really a credit to you and your team. Thank you again! And if we want to build again we know who to call. Build quality with Stroud Homes is of a very high standard, they look after all the little details. They assign a project manager to your home to manage the project from start to finish. The support team are with you all the way guiding you through the complete build, updates are provided on a weekly basis by people that know what is required. This is the 4th house we have built and i would have to say its really been a painless experience i have had a few concerns along the way but each time i have raised something Stroud has rectified it straight away, The builder was always only to happy to rectify or put my mind at ease and was very in tune with our goals. Cant say enough how accurate they were with everything we ordered, changes is of no problem to them at all. Very highly recommend Stroud Homes Casey after the amazing job they did building our dream custom home. Caleb and Ron were a pleasure to deal with, professional, friendly and organized with an excellent eye for detail and great customer service and personal skills. The build process was smooth and hiccup free thanks to Caleb’s detailed pre-construction process and Ron’s meticulous site management. All trades were quality, tidy and respectful. Stroud Homes provided an update everyday Friday (if not more frequently) and were always on call to answer our questions without delay. Very impressed with the quality of the finished product, the standard inclusions and the reasonable price point. Highly recommend you check them out if you after a quality stress free build, you wont be disappointed. Stroud Homes Northern Rivers, Great Team and service! I had been looking around different builders display homes for some time and nothing stood out, but when I saw the Wildflower Skillion, I just fell in love with it. I contacted Matt from Stroud Homes Northern Rivers and together we started on what would turn out to be a custom designed version of the wildflower home that is just perfect in every way. It was reassuring to have a team that would answer my questions truthfully, without holding back and give advice without expecting anything in return; from Larnah in Contracts Administration, to Jonathan who tirelessly worked to make changes for me during construction, to Rohan who executed them & did a great job finishing the home to my standard. Setting the house up on the block was very important to take advantage of the ocean views and together with a site visit, we got it spot on. Matt and the team at Stroud Northern Rivers were there to help all the way. Right from the very first phone call to handover, they have been fantastic to deal with. I am over the moon with the finished result and I have recommended Stroud to everyone that stops and admires the home. I can’t believe that this is actually mine! Very good quality built home. Very good and clever designs. Make sure of spaces. We really love it. Some minor defects were fixed straight away. Building time frame was good. We received update from supervisor during the construction periods. Staff are friendly to deal with. They always returned to our queries. Currently the home is used as a Display Home. The last time we built a new home was 37 years ago and we had many concerns about the daunting process of doing it all again. We looked at a lot of plans, display homes and building companies and in the end we chose to go with Stroud (Brisbane West). Jason Till and his team did an outstanding job building our new home. From the very start they patiently listened to our thoughts and ideas and guided us through the process of design using their experience and wealth of knowledge in the building industry. Building a home is a complex task and invariably things will go wrong, no matter who the building company is. The measure of a quality company is how they respond to those challenges and we are very pleased to say that, whilst we had very few issues, Jason and his team were always on our side. Any problems were remedied promptly and to our satisfaction. In the end we were handed the keys to our beautiful new home which was completed on time and on budget and we LOVE it. We would highly recommend Stroud (Brisbane West) to anyone thinking of building a new home. Our Dream has become a REALITY, thanks to Caleb, Ron, Trevor and the Team at Stroud Homes Casey. This House Project started for us almost 2 years ago, after visisting many display homes, speaking with many builders, but just not finding the right fit. I walked passed Stroud Homes Casey, just by chance stopped and looked at the plans displayed in the window, they looked like what we were looking for so I stepped inside, and that is when I met Caleb. From then we had various blocks to look at and things went backwards and forwards while we tried to find the perfect block. Finally on a wet Saturday morning Caleb met us with umbrellas on our Wet & Muddy block. And our Official Journey with Stroud Homes started. There were a great deal of delays with getting our land to finally title, and from the minute that happened it was “Action stations”. The building team & trades kicked into gear and our build started. We were kept informed at every step, were even able to be on-site with our familiy to watch the concrete pour of our slab, and have been involved in every single exciting step along the 6month journey. From the initail plan changes, to the quoting and final build contract it has been an absolute pleasure to work with Caleb and his team. The colour consult was seamless, and easy to do. The standard inclusions in the house are a step above standard inclusions offered by many other builders. The quality of the finishes in our home is outstanding. All the trades that worked on our property were outstanding and professional all the way through the build. We have only been in our house for about 3 weeks now, and we still have heaps of boxes everywhere with a “muddy” garden to do lots of work in, but it “Feels Like Home”. This is our dream home, and it was made possible by the team at Stroud Homes Casey. We would have no hesitation in recommending them to any of our family & friends. The quality of the build was above what we had seen with other builders. Stroud use high quality appliances and fixtures as standard. The build process was quite confusing for us. We felt that everyone was on a different page at times and it appeared the departments (sales, design, contract staff, builder etc) didn’t communicate well with each other. The initial sales person didn’t appear very knowledgeable about the products and procedures but the rest of the staff worked really hard to get us across the line. Overall we are so very happy with our lovely home and enjoy showing it off to our friends and family. Thank you Stroud Toowoomba! We couldn’t be happier with our new home. It is amazing! 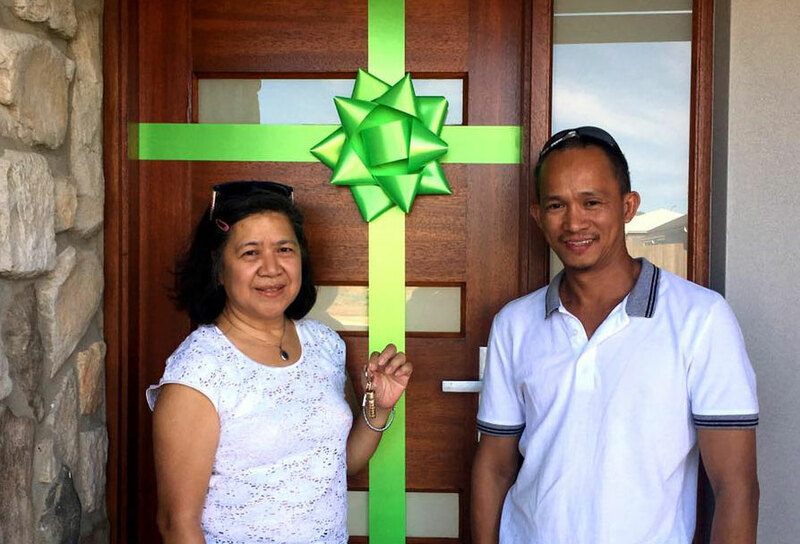 Thank you again for all your help and support to enable us to build a beautiful first home! Great job by all. – Jake & Nicole. The excellent workmanship of Stroud Homes’ staff members at Jimboomba, South Brisbane team, and their sub contractors’ are written all over the house they built for us in Mundoolun Estate, which we now gladly call ‘Adwaga Lodge’ – our HAPPY home! The visual and intricate quality of ‘Adwaga Lodge’ is superbly grounded in its confident and impressive physique on the street – we are now proud owners of a home built by a team with focus and standards. Throughout the built journey, we had genuine mutual and reliable interactions, respectful receptions and ethical engagements with every single staff member we dealt with within the Stroud Homes’ team. We may, arguably be the only home owners that’s built a house without the universal attendance of the characteristic stressful complaints with most building process. We were respectably attended, advised and informed at every stage of the building process; and for any query we had, we were provided with a honest advise, as well as options where indicated. The Jimboomba team’s customer service ratings from our experience and judgement is a 10/10; we couldn’t, at any one time or other, recall a behaviour that could have compromised, or fell short of the highest standards in professional etiquette. Of particular note is our engagement with the senior management team; we were very fortunate to have met and dealt with the likes of Bryan, Stewart, Rob, Thomas, Trudi and Emma. Without doubts, the entire team at Stroud Homes were unpretentious, and at their very best in ensuring we were well served! If we are ever opportune to build again, we’d, unreservedly call back on Stroud Homes to do us another honour! We built with Stroud Homes when they were a franchise. We had seen some of their homes going up in Flagstone, and we liked what we saw on the building sites. They seeemed to be be reasonably tidy and the progress seemed to move along well. So we decided to give them a go. The salesman Lucky was great and went above and beyond to help us with things, even our bank when they wanted a valuation last minute before building. Their interior designer helped us pick the colours. She made a few suggestions and while we didn’t do them all we were very happy with the end result. The supervisor [name removed], called us regularly about the house. There were a few hiccups, but we expected that (we’ve built before). The light switch to the media room is a bit hard to reach – it should have gone somewhere else. The house has been good- we’ve been in it for 18 months now. There was a hole in the backyard that turned up after rain and the developer came and filled that up. They came back too and fixed a couple of doors that started rubbing a couple months after we moved in. But all in all an easy and enjoyable experience and a great end result. We couldn’t be happier. Our experience with Stroud Homes, Port Macquarie has been rewarded with a home we can indeed be proud of. From the first meeting between Jim and Joel, we felt very confident that the build of our home would go smoothly. At a further meeting with both Joel and Alla, we were made to feel very supported and welcomed into the “Stroud family”. Any changes we made were met with an agreeable and swift manner. The workmanship of all contractors has been of the highest quality. We found the choices offered in the range of products to be excellent and beyond our expectations. We were overwhelmed with the list of so many fantastic inclusions, that other building companies would consider to be costly “extras”. Once again, Joel and Alla, thank you both for your friendly support and professional attitude. We would not hesitate in recommending Stroud Homes Port Macquarie to anyone considering building a new home. Dear Dan and Staff,It is with the greatest pleasure that we express our deepest gratitude to your prestigious Building Company and to you personally for doing an outstanding construction job to our Dream home in our canal front home in Birtinya Island.You had left no stones unturned when conducting the building construction job in every aspect of nitty gritty work carried out in completing the project and until the handover.Your company had turned our brand new home beyond our expectation. Right from the planning stage and until the last nail was hammered you had impressed us immensely.You also carried out extra jobs for us which was not included in the contract which helped in drastically reducing the unnecessaryheadache for us.It is with great pride and joy that we would like to recommend you to any prospective person or family who would be in the hunt for a respectful builder who could carry out the building job with great expertise and experience.I have no hesitation in recommending you to any customer who would like to build their dream home without any fuss or stress.With kind regards,Vimal and Julie, Proud Owners of Our New Dream Home. Thankyou Stroud Homes For Our Beautiful House! Greetings. I would like to thank you sincerely for the successful completion of the Priests’ House at Upper Coomera. Before I move into the new house , I want to tell you, that your work is greatly appreciated. I believe, we made the right decision in choosing you to be our builder. On behalf of all from my Parish Community who were involved in this project, I want to thank you and you firm and your tradesmen for the great work. We would like to thank Matt and Nicky, Stroud Homes Tweed Heads for completing our Avoca home so efficiently and professionally! We had a great feeling from Matt when we first went in to discuss our home plans and he didn’t disappoint! Our home has been finished under the contracted time and to a fantastic standard! We will be fully recommending Stroud Homes to our friends… We definitely made the right decision to go with Stroud and would definitely build with them again. Thanks so much Matt & Nicky, Tweed Heads! Thank you very much for your help in achieving our dream home. Right from word go Stroud Homes have been wonderful. We had heard so many horrible stories about building a house and thought twice about it. We couldn’t find an already built house that suited us so the only thing to do was build. We are so thankful we did!!! Stroud Homes have been awesome to deal with and it was just so easy. Every aspect was explained to us in detail and promises made were done. We highly recommend Stroud Homes to anyone who wants to build their dream home. We absolutely love our home and are so happy. Just wanted to say thank you so much for being an important part of us achieving our dream! We are so happy with our new home and if it wasn’t for your upfront honesty all those months ago we may not have been been here today. From our terrible experience with coral homes, you certainly made us feel like number 1! From the very beginning we had the utmost confidence in you and Stroud Homes and can honestly say that throughout the entire process we did not have a single stress! What a team! Mr Stroud should be blessed and proud to have such amazing, caring, loving and honest people working and representing his company! We would like to wish you and your family a very merry Christmas and once we’ve completed our finishing touches I’ll send you some photos of our home. We are thrilled with our new home and were extremely pleased with the service, efficiency and professionalism we received throughout the build. We would recommend Stroud Homes to anyone wanting to build a new home. I wanted to send you all a group email regarding our enquiry into one of your fabulous home and land packages. I really want to say that you are amazing a credit and asset to your companies. Bryan again you are a credit to stroud homes you have amazing designs that we love and your knowledge and helpfulness are amazing. You have all been great and have gone above and beyond to help us. Again thank you for your time and effort.